Ok, two days late but here is my version of the milans. I didn't want to add citrus flavor so I added some rum flavoring I had sitting around to the cookies. I thought the cookies were quite sweet so I went with bittersweet chocolate for the filling. These cookies were really rather easy. The hardest part was making pairs the same size to get a pretty cookie. The few that I made just circular rather than oval actually came out nicer & I'll do that next time. The original recipe said it made 3 dozen so I cut that to 1/3 which still yielded 2 dozen (the recipe never states how big your piped cookies should be so perhaps mine were smaller). Below is the recipe adapted to the smaller size with my notes in italics. I used bittersweet. Chop it very fine to get that small amount of cream to melt it. 1. In a mixer with paddle attachment cream the butter and the sugar. I just used the regular beaters & it seemed fine. 2. Add the egg whites gradually and then mix in the vanilla and rum flavoring. I used the tip that the other tips attach to which was about 1/2-inch & piped the cookies to be about 1 1/2-inch long. I used a silpad instead of parchment paper. My cookies took between 13 & 15 minutes to get brown edges. If my microwave was working I would have just heated the cream & chocolate in there since the amount of cream was so small. I did a thin amount & ended up with a lot of extra chocolate. Next time I'll do a thicker layer. Great job on the cookies, they look wonderful! Love Milan cookies and these look wonderful. I think I could eat the whole batch! Your Milan's turned out so perfectly sized and delicate looking. The rum flavoring is a great idea - I'll try that. Mmm, rum flavoring sounds good! They look great! Your milanos look great-- but I totally understand about trying to make the pairs of cookies fit together. 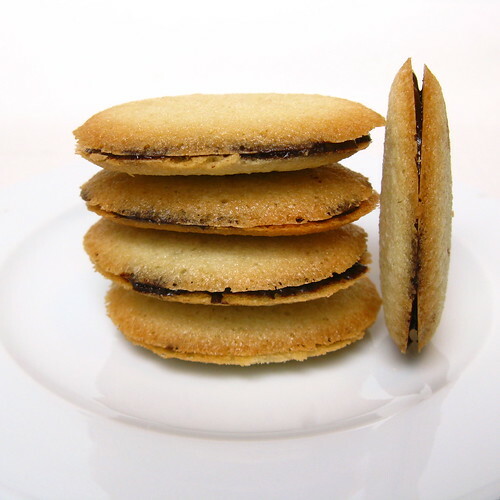 Pepperidge Farm Milano cookies used to be my absolute favorite! These look about ten billion times better! I went with bittersweet chocolate too. The rum sounds like it would pair really well. Your Milans not only look like the real thing, but ten times better due to the delicate, lacy browned edges. I too had trouble matching up cookies to sandwich, and when I got some perfect ovals, well close to perfect, I just turned the flaws to the other side..lol Great job on this challenge! Your milan's look fantastic! It looks like yours turned out nice and crisp/brown, which I've heard was a challenge (I did the mallows). Great job! I really like that you used rum flavoring! Great looking cookies!